The first album of The Journey with leadvocalist Arnel Pineda (foreground, with long hair) is now available in thePhilippines. The two-disc collection, Revelation, is released locally byMCA Music. When PEP (Philippine Entertainment Portal) interviewed TheJourney frontman Arnel Pineda during the 2008 MYX Music Awards last March, hementioned that he and his band mates would be releasing an album in the UnitedStates. By May, The Journey launched their album Revelation at the EllenDegeneres show in the United States. Through MCA Music, Arnel's kababayans will now be able toappreciate the vocal prowess of the Filipino singer who is the vocalist of theAmerican rock band The Journey. In the newly released album Revelation,Arnel performs with Neal Schon (guitar), Jonathan Cain (keyboards), Ross Valory(bass), and Deen Castronovo (drums). The brand new record will come in a beautifully packaged twoCD set, which includes 11 new songs and 11 re-recorded classics with Arnelon vocals. Revelation is the first album of The Journey to feature thevoice of the Pinoy born in Sampaloc, Manila. Guitarist Neal Schon saysabout Arnel, "We feel reborn. I think there's a lot of chemistry between thefive of us. The new stuff sounds tremendous. Everyone's so stoked about it. Wefeel very fortunate to have found him." It will be recalled that Arnel was discovered by Schon through the video- sharing site YouTube. 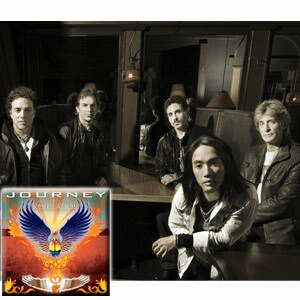 In December, Arnel joined The Journeyafter being a part of a Manila cover band called The Zoo. Six months later, The Journey kicked off a tour of Europe and the U.S. and released Revelation, anew album featuring original songs and re-recorded classics that has alreadyshot up to the fifth highest-selling album in the U.S. since its debut. Not many people know about Arnel's rags-to-riches story. Hegrew up in the Sampaloc area where his parents struggled to raise their foursons by running a corner shop and tailoring clothes. He started performing in local singing competitions but tragedy struck when hismother died. Only 13 years old at the time, Arnel's family became homeless andhad to live with relatives. He chose to live independently, collectingnewspapers and bottles, and living on the street for nearly two years. When hewas 15 years old, a friend encouraged him to start singing again. Thus began Arnel's 25-year career as a cover-band singer in the Philippines and Hong Kong. The hardships that Arnel experienced are now things of the past as the 40-year old singer enters a new phase in his career. "Arnel brings a soulful and passionate voice to Journey,"points out keyboardist Jonathan Cain. "His personality is very well-suited toour music. He's a sincere, authentic person with a great smile and a big heart.I think fans are really going to love him. With Arnel's soaring tenor, Journeyreturns to our heritage sound." Schon and Cain penned all 11 of the new tracks on Revelation.There is no lack of chemistry in Journey, beginning with the songwriting coreof Schon and Cain. "I felt strongly about moving forward and writing newmaterial. It was time," Schon states. Schon then put the call into Cain andstarted the song writing process. "There's an innate trust and respect for what we each do aswe weave our way through this music," says Cain. Schon adds, "In the alphabet,I might be a Z and Jonathan the A, that's just how opposite we are musicallysometimes. I write mostly rock and Jonathan writes most of the ballads, butwhen you combine the chemistry of us together, you'll find that it is thenucleus and sound of what is and has been Journey. And now, with the rightvoice in place, we have all the right ingredients." Revelation is available in all Philippine recordsstores nationwide, courtesy of MCA Music.